Yes, you read that right. 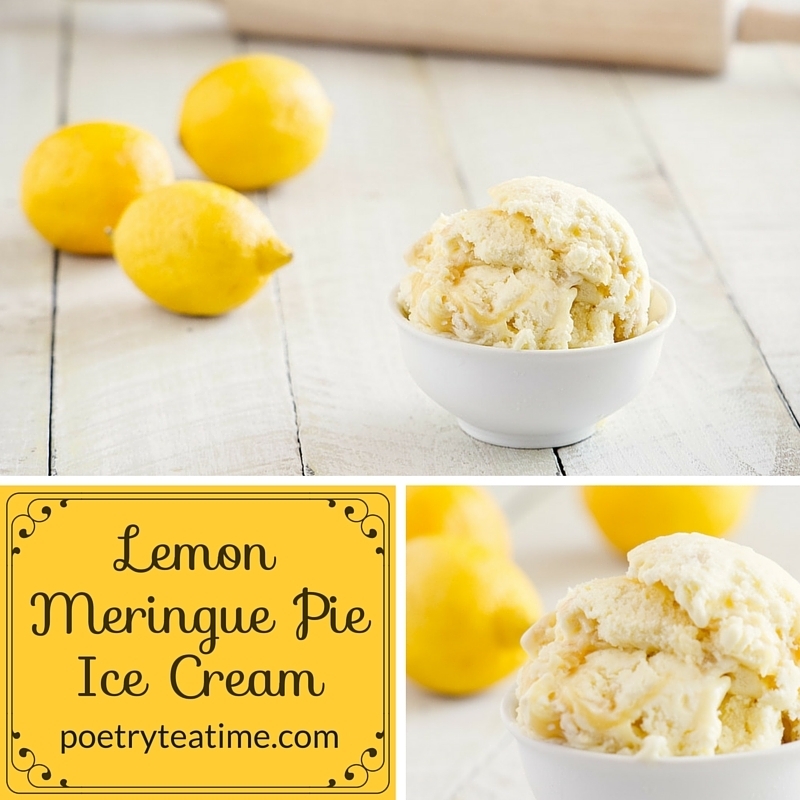 Lemon Meringue Pie Ice Cream. Doesn't that sound scrumptious? 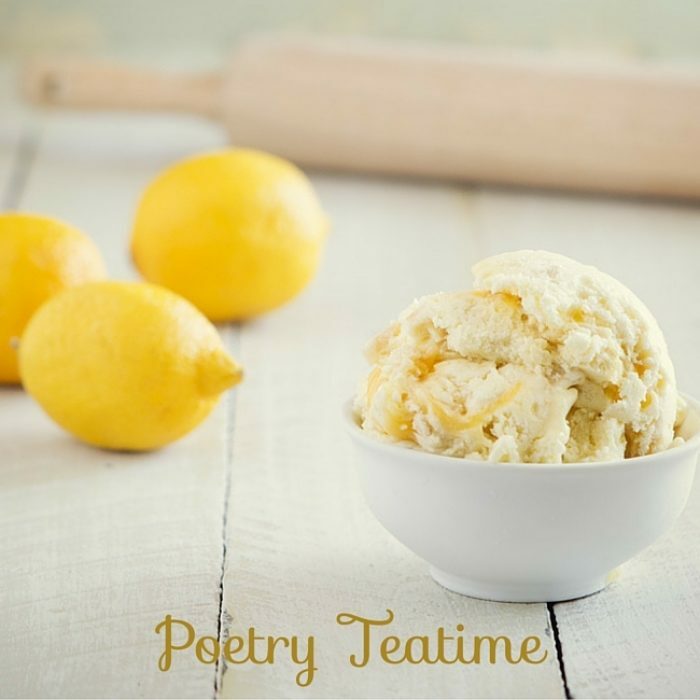 Beg, borrow, or buy an ice cream maker and try this for Poetry Teatime. Pour the cream into a large bowl and place a sieve/strainer on top. Whip the egg yolks until creamy and bright yellow and set aside. Mix the milk and sugar in a medium, heavy-bottomed saucepan. Warm the mixture over medium heat until it reaches between 140-150 degrees, stirring constantly to prevent burning. Gradually pour a small amount of the warmed milk into the egg yolks to temper, whisking constantly. Keep adding small amounts until the eggs have warmed slightly, then pour the egg mixture into the saucepan with the rest of the milk. Cook over low to medium heat until the custard thickens and reaches between 170-175 degrees or until the custard forms a film on the back of a wooden spoon. Strain the mixture into the heavy cream. Whisk in lemon zest. Put the bowl into an ice bath to chill quickly (the faster the base chills, the less icy it will be). Once it has cooled, refrigerate for several hours, preferably overnight. Preheat oven to 400 degrees F. Roll out pie crust to about 1/4 inch thick. Sprinkle lightly with sugar. Slice into small, irregular pieces. Bake for approximately 10-12 minutes. Remove and let cool. Put into a sealable bag and lightly pound with a rolling pin to break the pieces up a bit. Freeze the base according to the manufacturer’s instructions on your machine. Just before the end of the freezing cycle, pour in the pie crust pieces, letting the machine mix them in. Once the freezing cycle is complete, remove the ice cream from the freezer. Spoon a layer of the ice cream into a container, then spoon in a layer of lemon curd. Continue to layer the ice cream and lemon curd ending with the lemon curd. Stir just one time to get a nice swirl going through the ice cream. When done, put in the freezer in an airtight container for several hours to reach a firm consistency. If you have an ice cream maker or are thinking about getting one then definitely check of Nikki's eBook, chill, which includes flavors like Lemon Meringue Pie, PB&J, and Vanilla Caramel Pretzel Bite.